This is a plug-in hybrid diesel car. 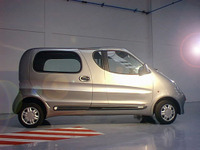 This is a compressed air car. They're both a heck of a lot better for the environment and for our foreign policy than our current addiction to fossil fuels. The plug-in diesel hybrid is a big step forward from the current crop of hybrids, not least because of different batteries that are not an environmentalists worst nightmare (don't get me started). The Speculist turned me on the the plug-in, which is also a pretty good idea. But plug-in hybrids would be revolutionary. The off-the-grid electrical equivalent of a gallon of gasoline costs about 75 cents. And if the reported all-electric range of 60 miles with an experimental plug-in Prius could be achieved in a production vehicle, most people would essentially burn no liquid fuel in their daily commutes. 60% cleaner air on a coal grid? I'd take that. 75% cheaper fuel? Sounds good to me. Speculist goes from there to the obvious recommendation to go nuclear (and being the Speculist, he goes from fission on to fusion!). I like the compressed air car idea better, but wouldn't it be cool to have two different amazingly clean gasoline alternatives duking it out in the free market to see which idea wins? And as long as gas mostly went away, who cares which one, or some other I don't know about yet, or an eclectic mix of three or more? Think the Chevy vs. Ford vs. Dodge vs. Japanese pickup rivalries are strong? They'd be nothing compared to this. I'm 46 years old, and I've been reading stuff like this since I was 11 and first took a subscription to Popular Science. These both feel like real technology to me, not pie-in-the-sky, not cool-but-it'll-never-happen. Those Iranian and Saudi sh*t heads are going to wake up one morning real surprised to find no one asking them for oil and their checkbooks empty. I believe the quote says that it is $0.75 per gallon off the grid, not that the gird is 75% of the cost of gasoline. In other words, at $4.00 a gallon soon for the price of petrol, this represents about 19% the cost to get energy from the grid over the pump.